First of all, I want to apologize to everyone in Boston and New England, Chicago, and all the other areas that have been buried in snow and still are. Spring must feel like a distant imagining. We have had an abnormally warm winter in western Washington. It was the warmest February ever — records began in 1891 — and the warmest December. Although January didn’t actually break records, it was up on the top short list. We did start out with some snow near Thanksgiving, and one forecast blog last fall opined that we were in for a cold snowy winter. Hah. It has been lovely. We will pay for it later, as the snow pack that provides our summer water is only forty percent of normal; the ski resorts are paying for it now, and their season has been dismal; some of them have suspended operations entirely. One feature of our February was that the temperatures didn’t go very low at night. Normally there would be more than a six-to-eight degree difference between the daytime highs and the nighttime lows, but that was our frequent pattern. March has gone a little colder, but too late: spring, happily self-confident, has already sprung. Plants started to grow and trees started to flower. It’s been interesting to see how differently they have reacted to the atypical conditions. Some have steadily held close to a normal timetable, and some have jumped the gun. 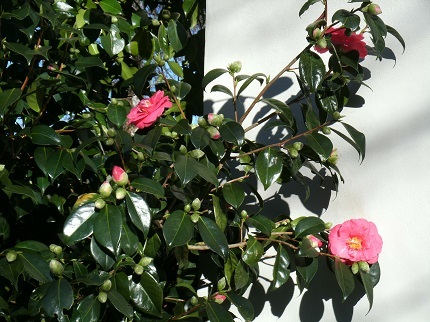 Who knew that the camellias were the most exuberant personalities around? Imagine that kid in class with a hand raised up as high as it can stretch, the student barely staying put in his seat, waving with excitement. “Ooo, ooh, me, me!” All over town, camellia bushes swelled into bud and burst forth weeks ahead of normal. Usually forsythia and ornamental plum trees are the first blossoming, but not this year. We have two camellia bushes, one at each front corner of the house. I was astonished to see tight little buds taking color in January. The north bush, the older and larger, with double blossoms, was opening at least five weeks earlier than normal, the first ones coming on the younger branches against the warmth of the house wall. This picture was taken on January 25, 2015. It is hardly a picture one expects to take outside at the end of January — not as far north as we live. As we drove about in early February, almost every arch of colored branches turned out to be camellias. There were the most common deep pinks, rarer red ones, white ones, and a few pale pink ones. 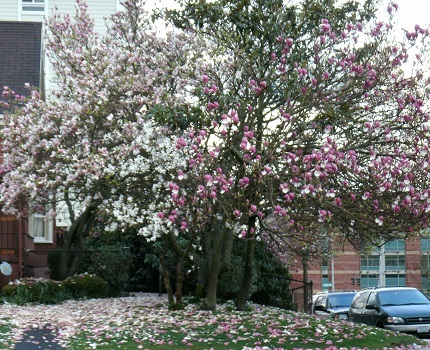 Magnolia trees opened into bloom, each variety in its own schedule. The white star magnolias were first, then the tulip-shaped varieties. It was interesting to see that, wherever they were, the sequence was always the same. 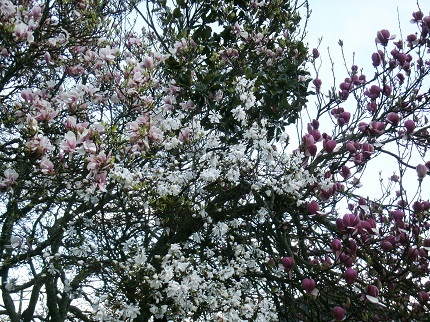 White star magnolias were the earliest, then the white-edged pink petals, then the darker purple varieties. They were consistent, even though they might be in different places and not separated by more than a week. When we moved into this house it was the end of March two years ago. The white flowering trees were budding as we looked the place over, and just fully out as we moved in. The camellia on the south corner showed color, and the buds opened up as we unpacked. Last year it was the same. This year, however, the camellias were gloriously in evidence as the white tree was barely budding. It kept to a fairly normal timeline, its process advanced by a week or maybe two by the unseasonable temperatures. The two together fill the window of the entry vestibule; two years ago their beauty was a wonder to me as I sat on the living room couch. Standing in the entry, we can see the street corner, but seated on the couch there is nothing visible but flowers. (They now fill the window, and the leaves will shade it all summer.) It is still a marvel to me. I sit there and just take it in from time to time during the day. I needed some marvels in the middle of all that change. Leaving our home of over thirty years wasn’t easy. In this picture the white tree’s blossoms are thick at the top (there is much more tree above what shows here), where the sun is stronger on them, and still opening on the lower branches. The camellia has grown considerably since last year, and its branches reach higher into sight, and show more color through the window; previously, it showed just in the lower corner. 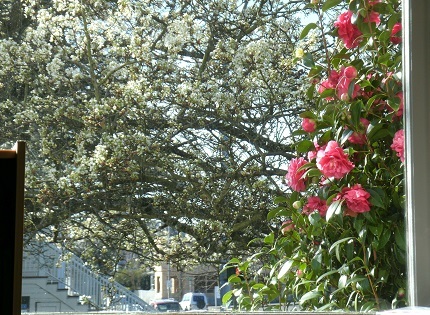 The camellia should be just beginning to show now, but it has raced ahead of its companion tree this year. The view from our vestibule window. The discrepancy I can’t explain is the hyacinths. I created a tulip bed in one of the back corners, where there was a concrete line already present, for no known reason. It made a natural boundary for rows of bulbs to wait for spring. 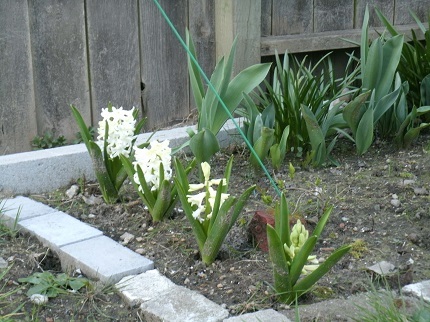 As an endcap, I planted a line of four large white hyacinths. Their holes were dug to the same depth, on the same day. Identical bulbs were planted at the same time, in the same way. The difference of time couldn’t be more than, say, ten or fifteen minutes that they had spent in the earth. Maybe the sun reflected on the fence increased the heat as their line went towards that back edge, but they came up and opened in a distinct sequence, back to front. All of them are fully up and opened now, but their arrival was not in perfect unison. It was, however, a perfect progression, as if each followed the example of the one before. Each had its own moment of final triumph. There is no such thing as “identical” — not when we really understand. The stand of magnolias, with its four separate trees, arrived in full and is now letting go of its various colored petals. You can see the purple at peak and the other blossoms beginning to drop. 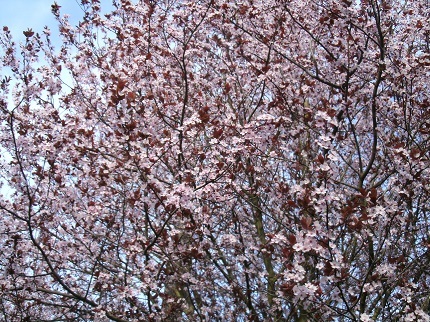 The early cherry trees are out, and the later variety, usually blooming in April, will come. The white flowering trees that are usually first, but were beat this year by the camellias, are now starting to leaf, and the petals to let go as winds begin to blow them to the ground. Spring will shift into summer and with it will come other types of growth and blooming. Everything comes in its own appointed way, responding to the signals and needs that are dominant to its divine design. This plum tree is flowering, too. We each have our own individual times and ways given spiritually in which we will blossom into knowledge. There are certain set conditions, and then there are surprises, as with the camellias. My hyacinths should seem identical, and yet they aren’t. Just when you think you know how life will go, it doesn’t. Just as you might think you can tell who will respond to the message of the gospel, God prepares a heart by warming trends you cannot see, and they are ready to shoot into growth now. Offer what you have. The Master Gardener watches over us all, and He desires to bring everlasting beauty and joy into all our lives. His Spirit will direct us to see the signs and take the chances that bring light and joy to others and to ourselves. I’m trying to be more mindful of the possibilities, and watchful for the opportunities.